Across my previous two Blog posts, I have lurched from my upgrade to a 50 megapixel monster, the Canon EOS 5Ds R, back in time to my early forays into SLR photography with slide film and the Canon EOS 500N. Today, I go 'Back to the Future', leaving the grainy memories of film behind for a return to high megapixel heaven. Allow me to rewind to a more recent date in late February, and Edinburgh Napier University’s Applied Terrestrial Ecology Fieldcourse to the Algarve region of Portugal around Albufeira. One of the elements that attracts us to run an Applied Terrestrial Ecology field course in one of the most tourist-dense areas of Europe (people do tend to look at me suspiciously when I say I am not going there on holiday...) is that, off-season, it is quiet and shows the resilience of its surviving biodiversity. There is always a danger, with tourism, that people can destroy the very qualities that attract them in the first place. The Algarve region is beautiful. The coastline is expansive in both its area and beaches, and typically Mediterranean with golden sand, blue sky and unique and interesting biodiversity: Mediterranean Basin Global Biodiversity Hotspot. These characteristics attract tourists and tourism attracts development. Those beautiful beaches start to fill with people and the adjoining headland curdles from rich wildlife habitat supporting plants, invertebrates, birds, reptiles and mammals, into concrete. Nevertheless, there is encouragement. Albufeira supports patches of greenery throughout and pockets and corridors of undeveloped habitat persist. There is also a strong and dedicated environmental movement (including A' Rocha) that fights to protect Algarve biodiversity and in so doing the 'natural capital' of the area. Short-sighted developers often overlook the long-term extinction of their holiday destinations in the scramble to bulldoze the very scenery and wildlife that attract many holidaymakers to the region. It is a tension (impact v benefit) that needs considered. Nevertheless, that the wonder of the environment and its wildlife are so accessible was a joy - and serves to remind me of why we need to take care of the world that we live in - as much within areas that we occupy as in wilderness areas (ideally) bereft of human pressure. The sea is an ever stimulating environment – simple, yet forever in motion, sometimes stormy, and often brooding in its colours. When the vista is empty of complications, and offers only sea and sky, there is an elemental simplicity and raw emotion to the photographic opportunities that it offers. When the sea presents rocky outcrops or ships, boats or sea-sports, there is a focus to the stimulation. 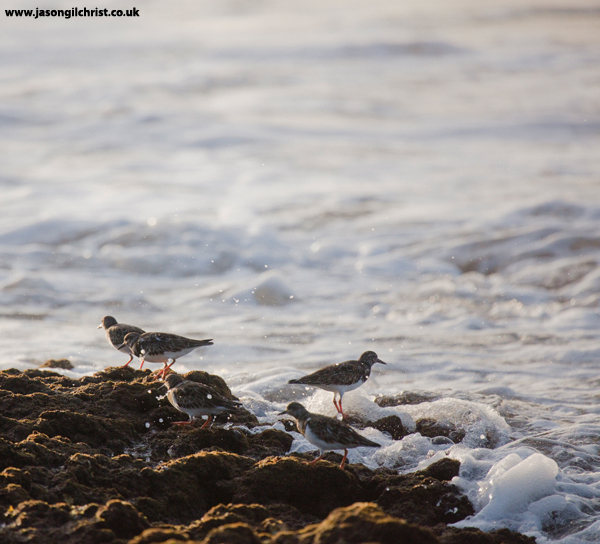 The empty early morning beach is a peaceful haven offering the attraction of waves, occasional rocks (with the tide out), and coastal birdlife. 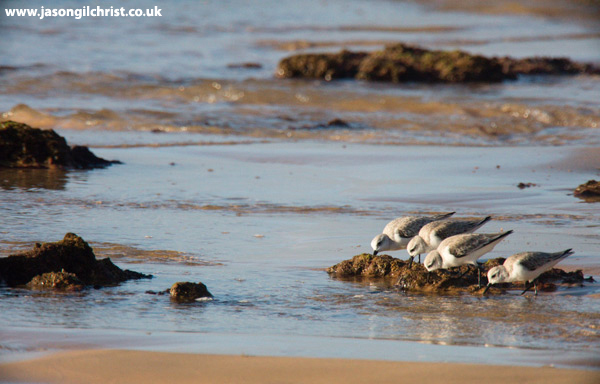 I am visited by some hungry wading birds that proceed to forage busily for marine invertebrates in the sand at the edge of the surf. Bereft of people, I revel in the isolation, and even allow myself to appreciate the drama and scale that the skyscrapers of development provide to a briefly vibrant sunrise. In the pink glow, even the ugliness of human development, takes on a sense of the surrounding beauty. Ecotourism: ideally when we visit a place because we value it we behave in a way that minimises negative impact and that maximises benefits to the environment. If we visit a location because we appreciate its biodiversity or landscape, or we discover that these ecosystem elements add value to our experience, then we need to find ways to feed that back to the location - to encourage local development and population to be mindful of those values and to therefore conserve and/or encourage them. The images below were taken on my early morning walks by the beach. 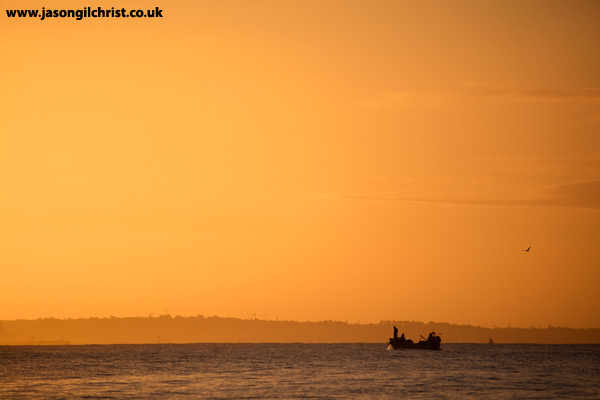 Algarve fishing boat at dawn. 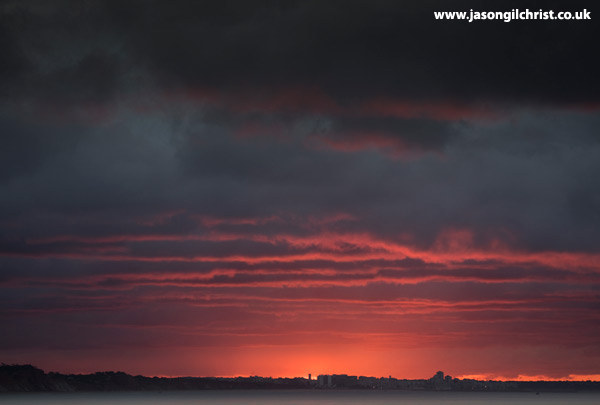 Dark dawn sky over Faro. The header image of the sea (the Atlantic Ocean) (click Blog if you cannot see it) was taken from Praia Santa Eulália beach, Albufeira, Algarve, Portugal.